A world's championship is to be fought out next Thursday in a spot which, within living memory, was an unexplored part of the Dark Continent. This will be the sculling championship of the world, and the scene of the contest will be the Zambesi River, close to the famous Victoria Falls discovered by Dr Livingstone, who, when he first saw them, committed, on his own confession, the only piece of vanity of which he was ever guilty. He cut his initials on a tree, and they remain to this day for the visitor to see. Since the railway to the Zambesi was completed in 1904 many thousands of visitors have been at the Falls, and next week's contest was arranged to take place there partly with the object of attracting world tourists' attention to their beauty and accessibility. The English sculling champion Ernest Barry, and challenger for the international title, had invited the holder, New Zealander Richard Anst, to travel to England for the race, but he was unable to raise the funds for the trip. (Traditionally the challenger would travel to the title holder's home country at his own expense, but apparently Barry was unwilling to make the long journey.) However the British South Africa Company offered to stage the match on the Zambezi, offering a £1,000 prize to the winner, and, presumably covering each athletes travel expenses. They believed the race would promote the Company and the region. Stakes and expenses were guaranteed by the Company and the match was arranged to be run over a 7km course on the Zambezi River on 18 August 1910. Barry travelled with three racing shells - two of these are being built by Sims Bros... and one by Bowers and Phelps. These racing boats are delicately made, and require such careful handling that when sent to a foreign country they are invariably packed in stout and sometimes tin-lined padded cases. These boats will be about 27ft long, 10 3/4 in broad, and about 6 in deep. The outside 'skin' of Mexican cedar wood is so thin that undue pressure by the fingers will make a hole. On arrival about two months before the race Arnst pitched his camp near the boathouse on the Zambezi, whilst Barry stayed in an hotel in town. Attending a dance one night Barry unfortunately fell and sprained an ankle and was laid up for about two weeks. The heat and the altitude affected both scullers but Arnst was the better of the two and he crossed the line in front of Barry to retain his title. 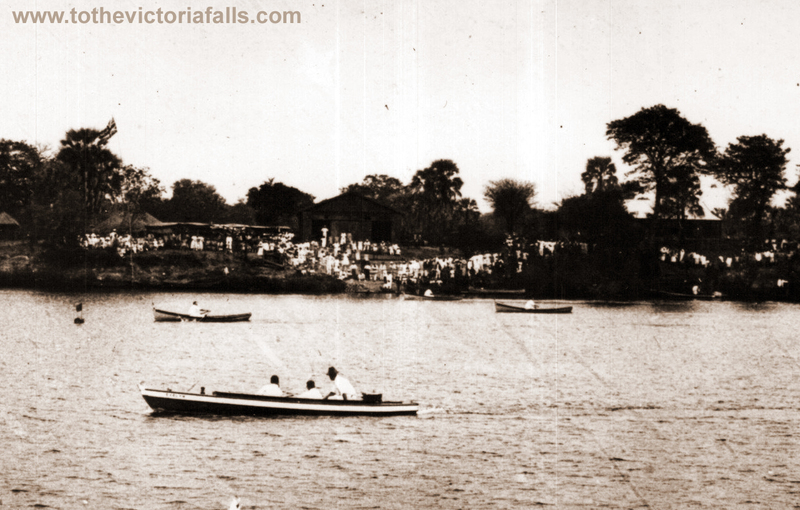 The Zambezi International Regatta, 1910. The Zambezi Challenge Cup was again won by East London, by two lengths, with Cape Town second and Southern Rhodesia third. The Rhodesia Cup was won by the Zambezi Boat Club beating Southern Rhodesia by two lengths. Other events included the Rabinow Challenge Cup (Pair Oars), won by East London, and the Victoria Falls Sculls, won by E G Williams. Rhodesia Railways carried boats and crews free from Beira to Livingstone and return. Lozi aristocracy again attended, arriving in a royal barge accompanied by 60-80 large canoes and 600 African paddlers. There were two alternaive courses planned for the Regatta - the 'middle' between Kalai and Long Islands, and the 'northern' along the north bank, past the boat house. The latter was used, with the start opposite the Mission Station and the finish opposite the Conservator's Cottage. "The race was organised by Guy Nickall (who rowed in the winning British Olympic crew of 1908, at the age of forty), and was over a course of approximately five miles. "Barry's opponent was Arnst, the Australian, and after the first three miles both scullers were so overcome by the unaccustomed heat and altitude that they stopped dead, unable to row another stroke. To Barry's dispair, Arnst, who had a chest expansion of ten and a half inches, recovered his breath first, and paddled home the winner. "Barry still regards that race as the hardest of his long career, during which he frequently won the world championship." The two men would race again for the title, in 1912 on the Thames, in a race which Barry won. 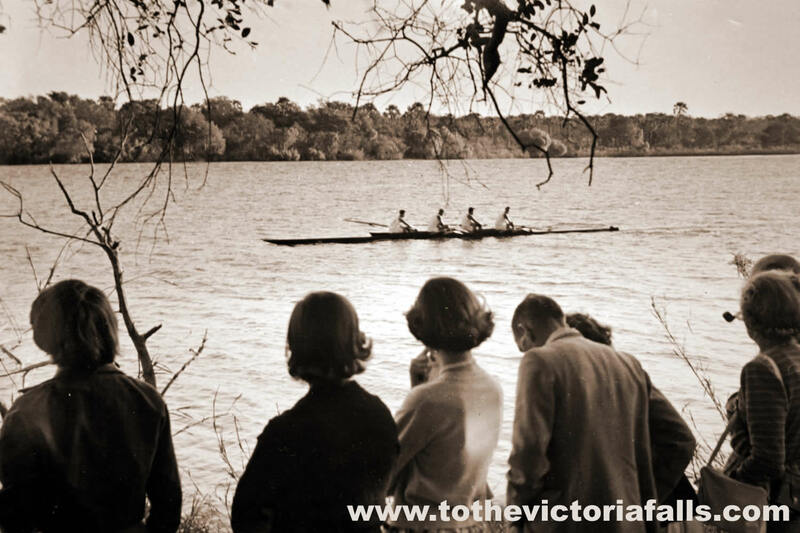 Watching the Zambezi International Regatta, 1953. 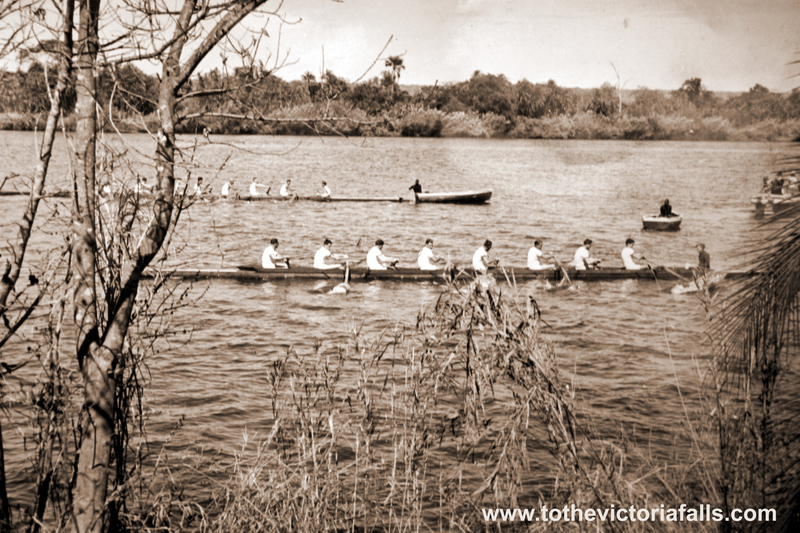 In 1953, as part of the celebrations planned to mark the centenary of the birth of Cecil Rhodes, another Zambezi Regatta was planned. Local supporters were given a good start to Saturday afternoon’s events by an exciting victory by the Zambezi Boat Club crew over their Salisbury rivals – Hunyani – in the Rhodesian Challenge Cup race confined to the Rhodesian crews. Zambezi were slightly ahead throughout and excepts for a few seconds when the Hunyani crew made their last spurt too soon and came within a length of Zambezi the result was never in doubt. It was once again the Victoria Lake eight which gave the crowd its biggest thrill of the afternoon when they nosed past the post half a length ahead of Wits University in the open eights final. It was anybody’s race until the last 50 yard when, striking 42, the winners finished with a burst which had to be seen to be believed. Apart from the South African intervarsity boat races, the senior of which Witwatersrand won by two lengths from UCT an the Rhodesian Challenge event, two South African rowing clubs cleared the board at Saturday’s finals. They were Kroonstad, who won four of the six finals, and Victoria Lake, whose rowing in the Centenary Eights was described by the umpires as the finest they had seen outside Britain. After a two-hour break in the rowing programme during which the powerboat pilots made attempts on South African records, the afternoon programme commenced with the Rhodesia Challenge race over 1 mile between Zambezi Boat Club and Hunyani Rowing Club. The Hunyani crew averaged 8 lb . per man heavier than Zambezi, whose 10 st . 9 lb. was the lightest average .for a male crew in the regatta. Hunyani were off to a very fast start, and were a canvas tip after the first few, strokes but Pringle settled down to a -very steady strike and the boats were level after the first ten strokes. Zambezi were a canvas up at the end of the first minute, rowing strongly and steadily at 33 to the minute, whilst Hunyani were striking at 29 . The home crew continued to draw away steadily and were two lengths to the good with 1/4 miles to go. Christie, the Hunyani stroke, made half-minute a final effort in the last and increased the strike considerably. The lead was reduced to less than a length, but at this stage there was little doubt that Zambezi would be comfortable winners. The speedboating was the first of its kind on the Zambezi. A crowd conservatively estimated at nine thousand (over two thousand adults paid for admission and children, Africans and some three hundred guests were admitted free) lined the north bank of the Zambezi on Sunday to watch the most thrilling spectacle of sport Livingstone has ever seen. From first light until nearly dusk the river reverberated with the noise of powerful motors as South Africa’s finest speedboat pilots and fastest craft competed in race after race on a one-mile circuit marked out by four-buoys. The one spill of the day occurred in the ‘E’ Class Victoria Falls Championship when Tommy Durand over-turned ‘Miss Mavis’ on rounding the buoy at high speed opposite the Boat Club. A rescue launch was on the spot within a matter of seconds and Tommy was picked up little the worse for wear. Mrs Makepeace’s performance was superb. Entering every race for which he was qualified, she was consistently amongst the winners and hurled her beautifully-tuned outboard around the buoys with the cool precision of a veteran. Her duels with Felix Du Plessis in a boat of similar size and power were amongst the most exciting spots on a programme filled with excitement. One of the greatest compliments which could have been paid to the organising committee of the Zambezi Regatta was made by Mr . H. J. McJannet, president of the South African Amateur Rowing Union in the course of a speech at the presentation of rowing prizes on Saturday afternoon. "In fifty years of rowing experience, which has taken me to regattas in almost every country in the world," he said, "I have not had the pleasure of seeing a better organised regatta or one that has not only been right up to time all the time but in several cases even before time." Mr. McJannet thanked the committee on behalf of the South African oarsmen who had competed and said that every one of them had been overwhelmed by the generous hospitality accorded them . He had never seen a more pleasant stretch of water on which to hold a regatta. His Excellency the Governor, Sir Gilbert Rennie, introducing the Hon, Betty Clay, who presented the prizes, said he hoped the event would be repeated in two years' time when Livingstone celebrates the Centenary of the discovery of the Victoria Falls. The Zambezi International Regatta, 1950s. The Livingstone Mail of Wednesday, 13 July, 1955, records the attendance of the Governor of Northern Rhodesia, Sir Arthur Benson, at the 1955 regatta. Witwatersrand University brought two 8 men hulls and raced against Leander Club. In 2004 the regatta was brought back to the Zambezi, pitching crews from Oxford, Cambridge and South Africa (from Rhodes and Rand Afrikaans Universities). Ernest Barry’s grandson, Bill Barry, rowed an exhibition race marking 100 years (or more accurately 99 years) of watersports on the Zambezi. The regatta has been held four times since, in 2005, 2007 and 2010. In 2007 the event included Brown University from the USA. In 2010 Regatta (sponsored by Sun International hotels the Royal Livingstone and Zambezi Sun) had teams from Oxford, Cambridge, Cape Town and Johannesburg Universities competed in rowing events over distances of 500m and 2,000m in traditional eights shells. The rafting event was held in the gorges between rapids 1 and 7 on Tuesday 21 September. There were also a number of local competitors in the canoe, raft and makoro races. It is intended that the Zambezi Regatta be held once again in September 2012.